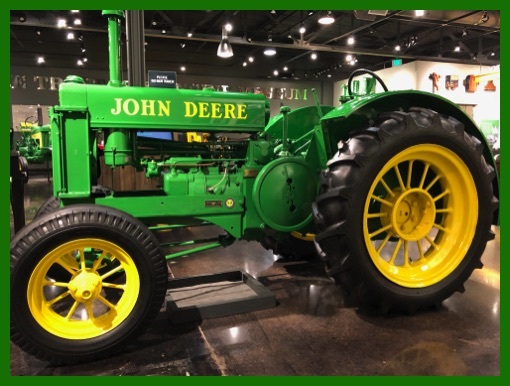 Left: "John Deere, the Man" poster at the museum. 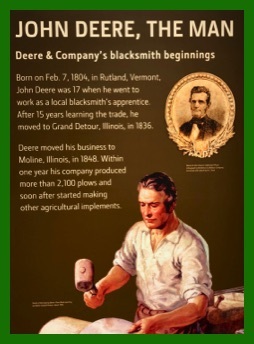 Above: John Deere's agriculture career began in 1837 when he introduced the first steel molded farm plow. 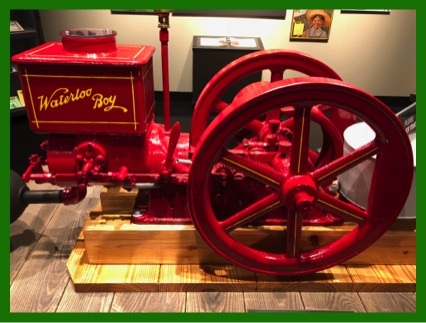 Right: The Waterloo Engine Company manufactured small gasoline engines, such as this, when the company was purchased by John Deere Co.
June is a special month for tractor lovers--like me. Yes, it is a special month for farm boys--like me. 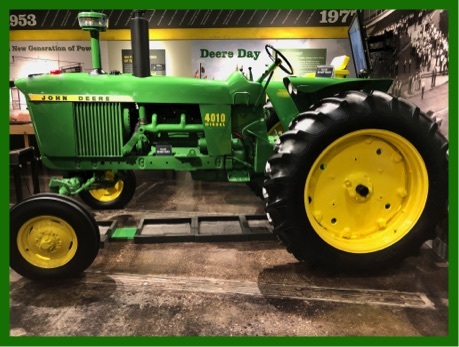 June-2018 is the century mark for the John Deere tractor. 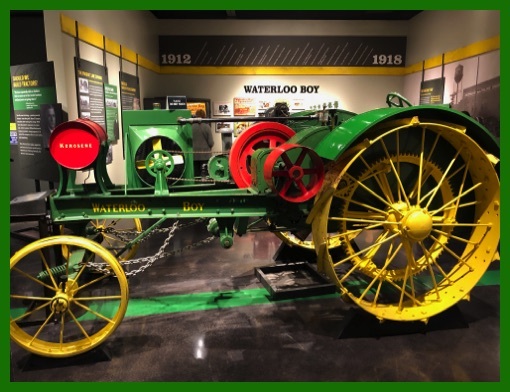 To mark this very special 100 year anniversary, I want to invite you to join me as we walk through the John Deere Tractor and Engine Museum in Waterloo, Iowa. 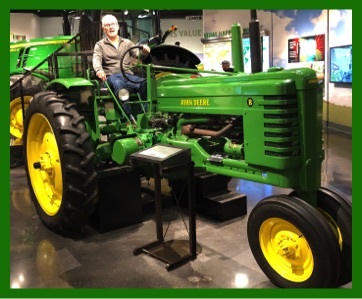 This big photo collage at the John Deere Tractor and Engine Museum in Waterloo makes a powerful statement. 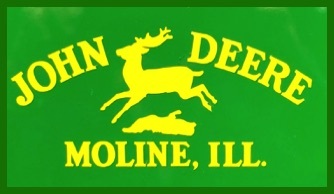 John Deere (and many other farm equipment manufacturers) now have a presence worldwide. It is estimated the world population will reach 9 billion people by 2050. 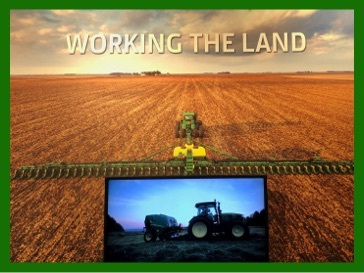 It makes me happy to know that farm equipment manufacturers, fertilizer companies and countless others are stepping up to the challenge of providing food for all people in all nations--everywhere. 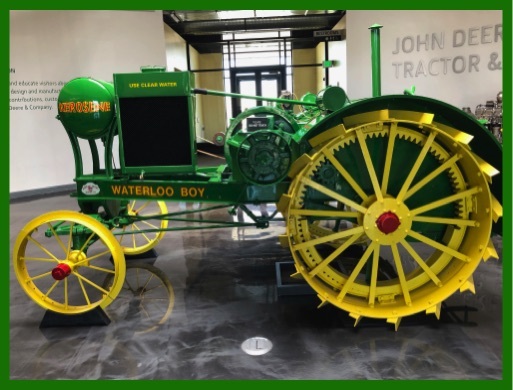 John Deere introduced its very first tractor, Waterloo Boy, in 1918. 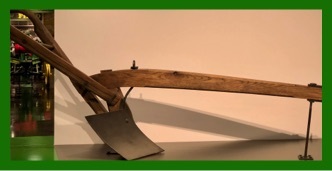 I think farming technology was actually taking root right then. 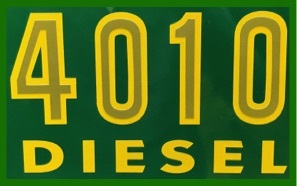 The engine had a duel fuel tank--it started with a small amount of gasoline and after the engine was warmed up, it switched to a cheaper fuel--kerosene. 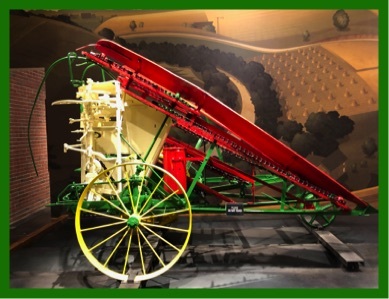 Left: This Deere and Monsur 2 row rotary corn planter was built in 1881. Notice the spool of wire that was rolled out to tell the planter where to drop the kernels of seed. 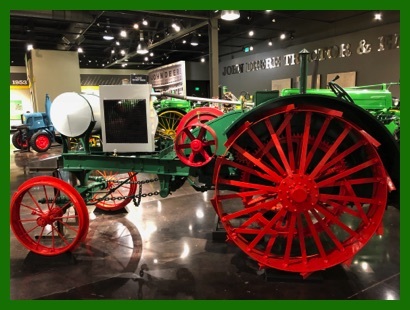 Compare that with the John Deere 48 row planter featured on the interactIve museum display (right) entitled "Working the Land." This machine is all GPS controlled and knows exactly where to drop each seed--plus much more. 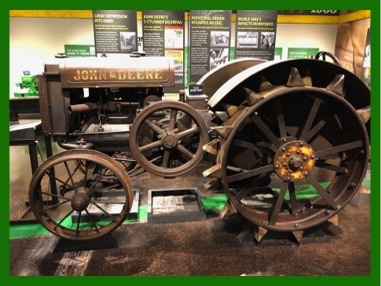 Left: This John Deere corn binder was built in 1938. It cut and bound whole corn stalks which were later put through a grinder and used for animal feed. I remember my dad cut and shocked some corn stalks with ears in place to help feed his animals during the winter--but he did his by hand. 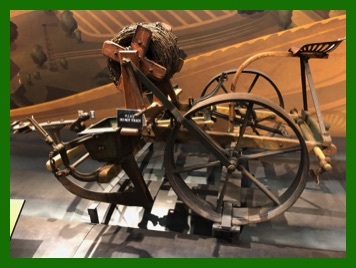 Right: An early experimental tractor. 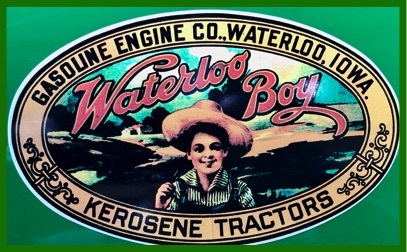 I do not believe this was ever manufactured for sale, but paved the way for the Waterloo Boy. 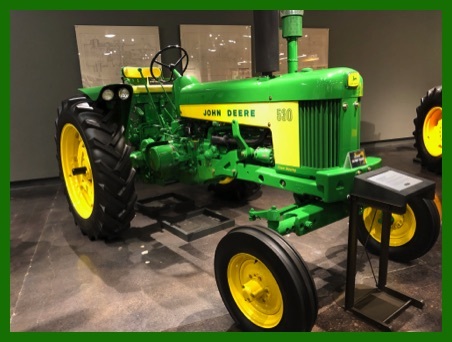 Left: The Model B was the first tractor we had--when my older brother was old enough to do the farm work. 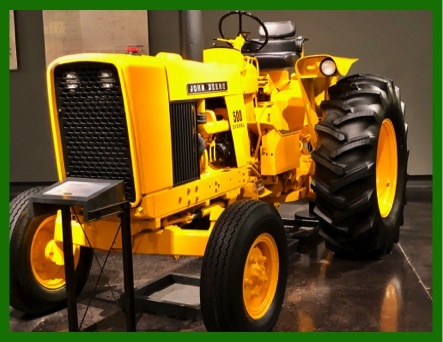 Right: The model A was the type of tractor I had when I was "farming in the fifties." 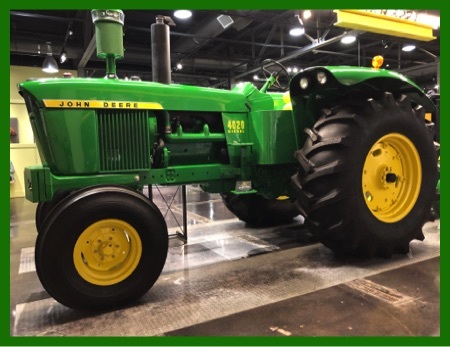 GOING GREEN FOR 100 YEARS. 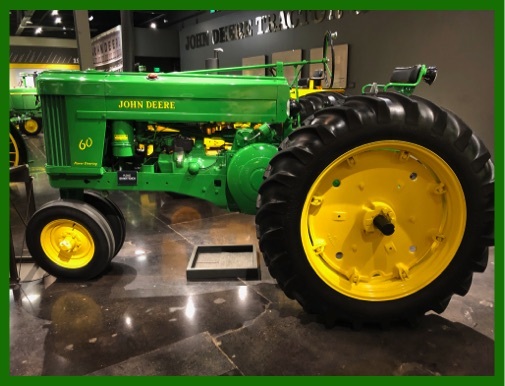 John Deere--the tractor--is celebrating a century of progress this month. 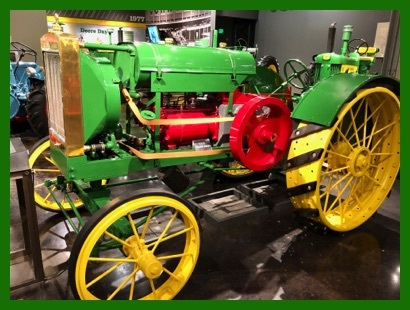 The first ever John Deere tractor rolled off the assembly line in June, 1918. 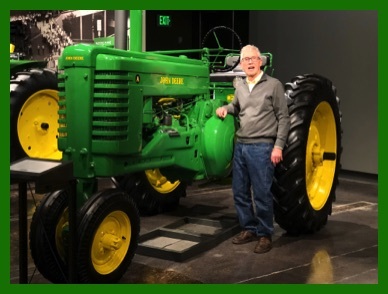 I am happy I had the opportunity to visit The John Deere Tractor and Engine Museum in Waterloo, Iowa to celebrate this special occasion.